I took the base of my ice cream maker out of the freezer because it was taking up too much real estate only to put it right back in. I love ice cream but don't make it that often. I'm really not very good at it and a pint of something is always on sale at the market to completely validate not going through the hassle. I wish I were the person whose affection for ice cream sprang up in the warm summer months but I don't discriminate based on weather. I love it, always. But now that our nearly two-year-old sees and wants every treat we reach for, I thought it was appropriate to try this coconut and cashew based recipe sweetened exclusively with maple. I've also gotten better at stashing cookies out of sight. I've made fully coconut milk-based ice creams before but adding the cashew cream was a really nice touch; breaking up the coconut milk flavor while still being super creamy. The thing is, sure it tastes different, but it is creamy and sweet with crunchy bits and a scoop with a sprinkle of granola on top is just the thing. As it goes with dairy free ice cream, the result is a little more icy than the real stuff. After it's completely frozen, let it sit for 10 minutes before scooping. Note that the cashew cream requires starting a step the evening prior. In a cast iron pan over medium heat, warm 1/4 cup of the maple syrup and vanilla until thin. Add the pecans, sea salt and cinnamon and stir to coat. Transfer to parchment to cool completely. Mix the arrowroot or cornstarch in a large bowl with 2 Tbsp. of the coconut milk to dissolve. Once dissolved, stir in the remaining coconut milk, remaining 1/2 cup maple syrup, cashew cream and vanilla beans if using. Put the mixture in the fridge to chill for a couple hours. Churn the ice cream according to your machines instructions. In the last couple minutes, add in the mapled pecans and chocolate. Freeze for a couple hours to get a firmer, scoopable state. * To make cashew cream, soak 1 cup cashew nuts, covered, overnight in cold water. The next day, drain and rinse well. Blend the nuts in a high powered blender for a couple minutes with a fresh cup of cold water until completely smooth. You can adjust the amount of water for how thick you want it, for an ice cream base, you need it pretty thick. LEMON MERINGUE ICE CREAM PIE + NEWS. First off, thank you for the sweet notes from last posts' news. I was so excited to tell you people and your congrats and affirmation exceeded my expectation - thank you! I wish there was a way for me to make you a dairy-free based peppermint ice cream - for you and me both actually - but this is just a flavor that I can't translate to the coconut based sort. I will point you towards this mint chip which looks fabulous if there is a dairy allergy or intolerance. True peppermint ice cream should only come out around the holidays, if you ask me. It's something sacredly seasonal like egg nog or reindeer on the lawn. I love it more because I don't have it year round. My grandparents used to bring us over a big styrofoam container of it from a local ice cream shop when it came out for the season. I get my ice cream fondness from my PopPop, who has since passed. The ice cream had little specks of red and green throughout from the peppermint candies - the element that sets peppermint and mint chip apart. My whole family loves the flavor, but it still reminds me of my grandparents. 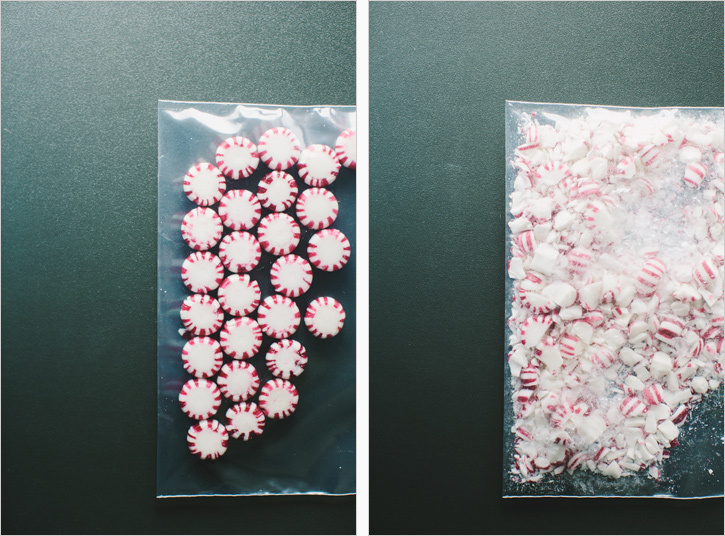 The brands that offer peppermint at the market are either chock full of crap ingredients or pricey for a tiny pint we would eat all too quickly. 'Tis the season for special treats. Trees! Holiday tunes! Bundling and looking at lights! Hope this beautifully crazy month has started off well for you all. I use the peppermint candies from Trader Joes. They don't have any coloring or corn syrup in them, so seem the least junky option for a peppermint candy. 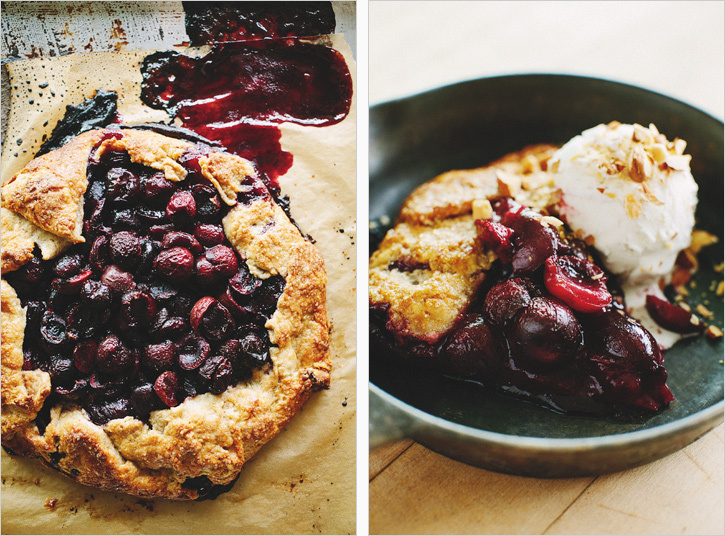 The cornstarch is optional here, but I've been adding it ever since I tried the Jeni's method. She uses it to reduce the amount of ice crystals in the mix, and while I am using a custard base here, not her eggless one, I figure it can't hurt. Don't challenge my science, just know it's optional. Set a large glass bowl above a pot of simmering water, not letting the bottom of the bowl touch the water line. Add the egg yolks and sugar into the bowl and stir occasionally until the sugar has mostly dissolved the the yellow has paled in color. About 5 minutes. Set the bowl aside. Mix 1/4 cup of the milk with the cornstarch and set aside to dissolve. Empty the water from the pot, put the remaining milk and cream in the pot over medium heat and warm until bubbles form on the outer edges. Slowly add the warm cream to the yolks, stirring as you add. Stir in the cornstarch mixture and the peppermint extract. Chill the mixture in the fridge for at least an hour, preferably closer to three. 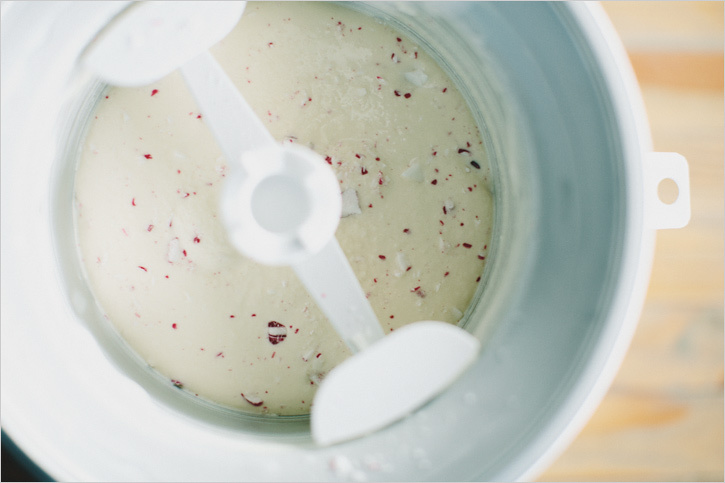 Put the mixture in an ice cream maker and churn according to instructions. In the last minute, add the peppermint candies. Take a bite, if its not quite minty enough for you, add another splash of extract. 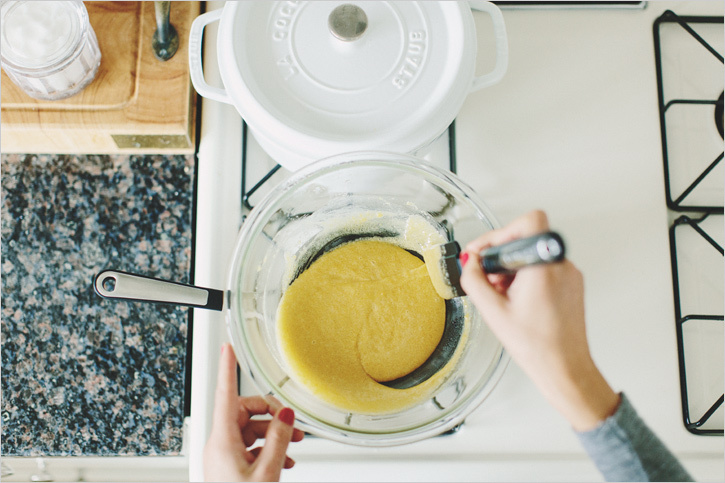 Transfer the mixture to a container for the freezer, and freeze for at least a few hours to firm up. Top it with hot fudge, chocolate cookies, inbetween cookies for an ice cream sandwhich etc. "Are you ready?" I asked Matt. He and I have intermittent conversations about his life. I feel like he trusts me, or at least respects me enough to tell me what's going on in his life despite us only seeing each other one or two days a week at work. As jobs go, I am the girl who goes in super shy - like, this girl is creepy-quiet shy. I observe and perceive, pick out the people I feel are reliable, good people, no drama and only then do I open up and show my colors. The sass comes through, I'll bust out my moves to Michael Jackson's Thriller when it pipes through the speakers, because I know you'll laugh (you = my trusted people). I am pleasant to everyone, but to the handful that I see will give back to me in conversation, I try to communicate that I care about them and want to hear about their story. Matt tells me about his life. Or as much as you can tell in the ten minutes here or there while we're working beside each other in a given shift. He's told me that he found the "little lady" (his words) he'd like to spend his life with, and how he now needs to figure out how to buy a ring. We talked rings, he worried a bit when someone told him the cliche, "It should be four months of your income." I told him that doesn't mean anything. Because I'm a ring whisperer? No. Because it doesn't mean anything. All I asked was if he was ready. "What?! What do I need to be ready for?!" he panicked. I don't know that anyone can warn you for how complicated and humbling and broken and outrageously fun and sometimes dark and sharpening marriage is. Our struggles are different than what Matt and the little ladys' will be, but there will be some. It's built to be that way, the refining of ourselves by exposing weakness, building the other up, being torn down and doing it again to become better, truer, finer versions of us. Like a knife against stone, friction that yields a better product. Iron sharpening iron. Being known and loved... is it my place to prompt him of this? So, I just asked if he was ready, because really, I haven't figured it all out, but being ready or not is all you need to know. You say yes to fighting for this person. Everyday. Not how many thousands of dollars you have for a ring, my friend. I appreciate new people, new perspective, new stories. It makes me intentional and aware about the things going on in my own life that sometimes fly by in routine. On a completely unrelated note, this was my first time with a galette. 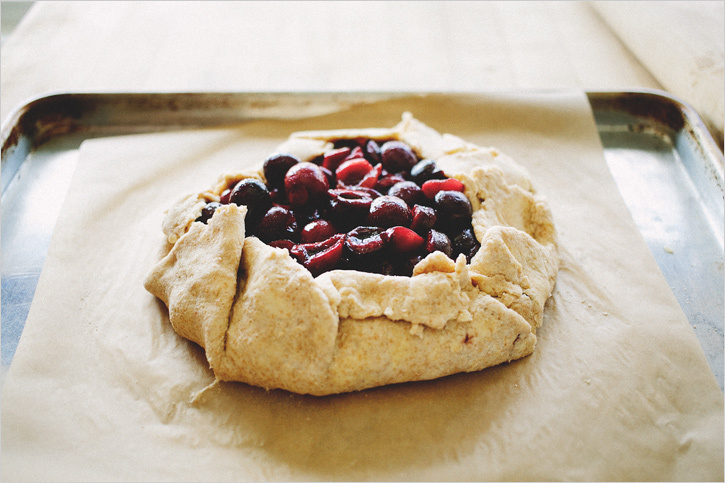 I don't love pie crust - as a treat or making it. It's a little stressy to me. Keep all the ingredients super cold! Don't touch it too much! But I have had this on the brain for other crust loving people in my life. And because I think they look rustically gorgeous. I like the cherry and almond pairing and tried to pull that through with the extract, but it is quite subtle. Even still, I wouldn't add more because too much extract doesn't really make it taste more almond-y, it just gets sort of bitter. The crust has a gentle yield to it from the bit of yogurt but there is still a nice crunch to the edge. The vanilla ice cream is not an optional ingredient here - I can't imagine this not a la mode, then again you're getting your report from an ice cream girl, not a crust girl so I'll leave that up to you. I know the tool is only useful for a short season, but owning a cherry pitter for situations like this, fruit salad or cherry cocktails has been well worth it. I can't find the brand I own but this one has pretty good reviews. 3 cups pitted cherries, about 1ish lbs. 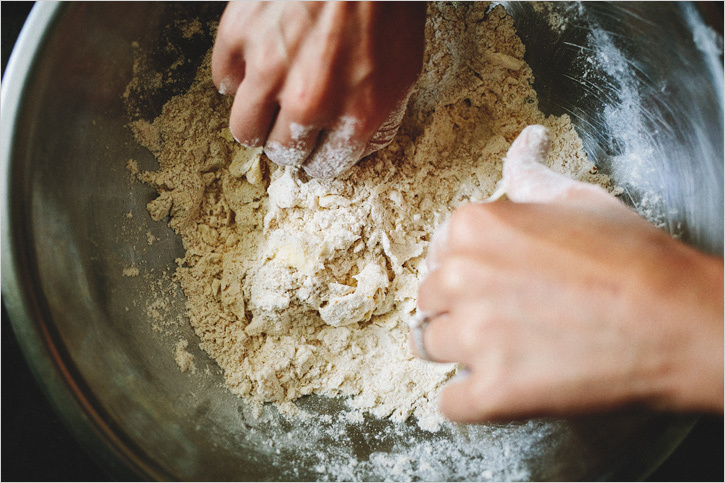 In a chilled bowl, combine the all purpose flour, spelt flour, salt and sugar and stir to combine. Working quickly, work the cold butter into the flour mixture with a pastry cutter or tips of your fingers. Smush it until the butter is the size of small peas. In a small ramekin, mix the lemon juice, yogurt, extract and water and give it a stir to combine. 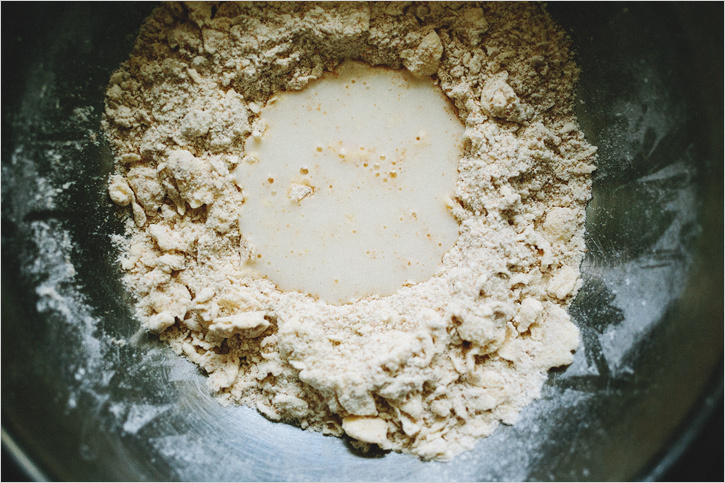 Add it to the flour-butter bowl with your hands or a wooden spoon until just combined, being careful not to overmix. Pat it into a bowl, wrap in plastic wrap and chill in the fridge for at least one hour or overnight. Preheat the oven to 400'. Prepare a parchment lined baking sheet. Halve about three quarters of the cherries, leaving some whole. Put them in a mixing bowl with a pinch of salt, orange juice, flour, nutmeg and muscavado and stir to combine. 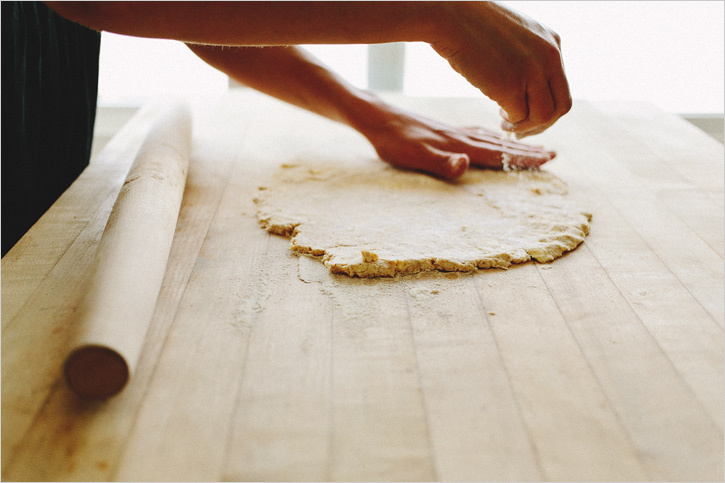 On a lightly floured surface, roll out the galette dough to a roughly 12'' circle. Transfer to a parchment lined baking sheet. Pile the cherry mixture in the center leaving a 2'' border around the circle. Fold the border towards the center, don't be afraid to pull in tight, it will settle. Pleating the dough to make it stick to each other. You don't want thick folds of dough, think more pinching. 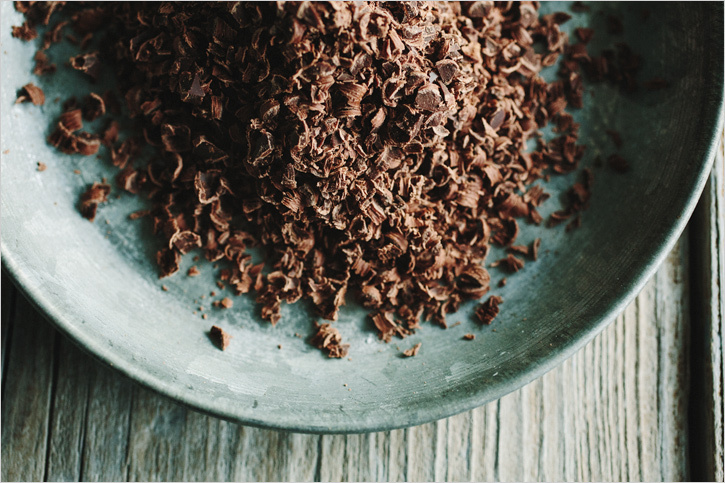 If it starts to feel room temperature, pop it back in the fridge or freezer for ten minutes. Mix the egg and water together and brush it on the outer edges of the dough. Sprinkle it with turbinado sugar, if using. Bake the galette on the middle rack for 40-45 minutes until the edges are nice and brown. Time may vary depending on oven. Remove the galette (and parchment too if need be) to a wire rack to cool slightly before serving. 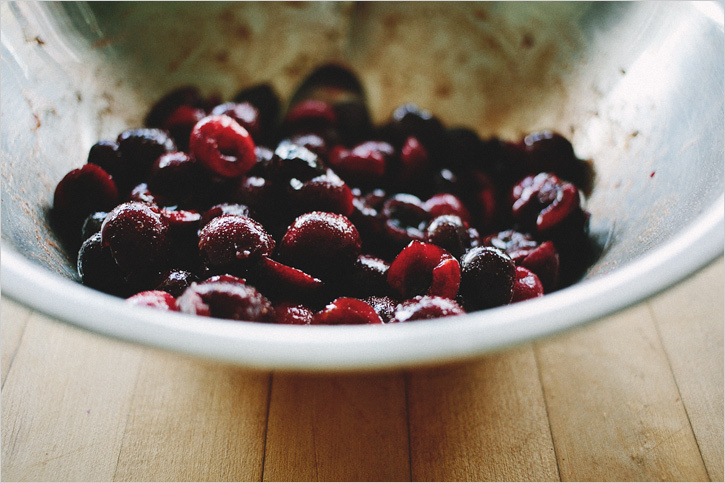 Sprinkle half of the almonds on top of the cherries. Serve each wedge with a scoop of ice cream and another sprinkle of the almonds on top.